Snooker has "a place" for new, quicker versions, to excite fans and get them more involved, says Ronnie O'Sullivan. And the five-time world champion believes innovative events could exist alongside major tournaments such as the Masters and World Championship. He told BBC Sport: "The only way to get crowd participation is to tweak rules. "You'd have to put a shot clock on, you'd have to have some sort of bonus ball somewhere in there which can turn the game around if it's going one way." Referring to the animated crowds at the recent BDO and PDC World Championship events, 39-year-old O'Sullivan added: "If you look at darts, you have the nine-darter, you have each game finishing off with a double, sets are over pretty quickly. "Those moments happen pretty quickly, and can happen again pretty quickly, so the crowd have always got something to cheer for. "To try and capture that darts kind of vibe, I think you need something like power snooker. As soon as you have one 45-50 minute frame, you've lost the crowd." 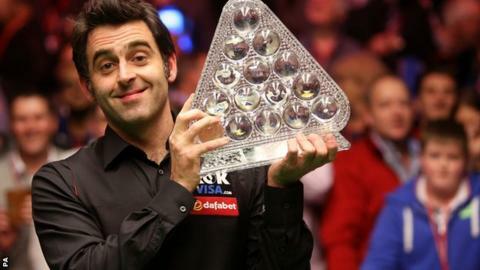 The five-time Masters winner begins the defence of his title at London's Alexandra Palace on Tuesday against Ricky Walden, an opponent he defeated 6-0 in the quarter-finals of last year's tournament. And the Essex potter begins his campaign knowing that he is just two century breaks away from matching Stephen Hendry's 775 career record. "I'm proud to still be in with a chance of maybe equalling some of those records, maybe passing it," the world number three said. "It depends on how long I play for."